It has been said that funerals are not for the dead but the living. That ideally they should provide an opportunity to say goodbye to a loved one that will both comfort the grieving and even raise the spirits. And that’s when the idea of a bespoke funeral service for motorcycling enthusiasts came to pass and he set to work designing a sidecar hearse. In fact so convinced was he by the idea he even went to the trouble of patenting his design concept. 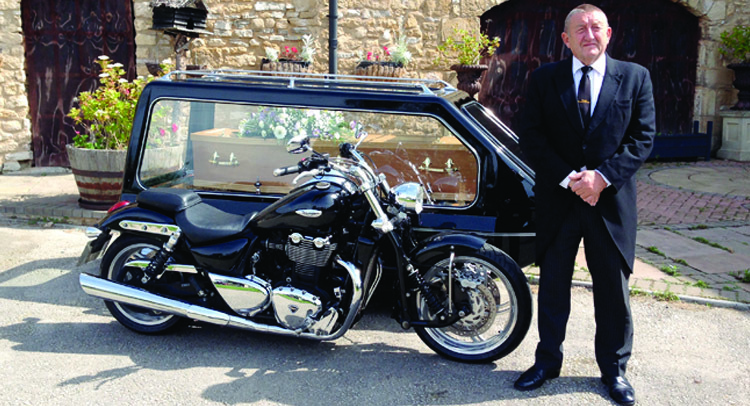 15 years on, Motorcycle Funerals are proud to have catered to the needs of the bereaved and have provided the final ride for clients ranging from terminally ill children to old wartime despatch riders and even retired racers. Interestingly, Paul doesn’t believe that funerals need to proceed at a stately pace to be respectful. Indeed quite the opposite. On one occasion he was requested to do the ton with a client onboard. Happy to oblige Paul duly delivered. Needless to say that wasn’t on the public roads. Nor indeed was his record attempt for the World’s Fastest Motorcycle Hearse which stands at 126.6mph. That required the services of a Suzuki Huyabusa which is still on the fleet, along with Triumphs and a Harley. 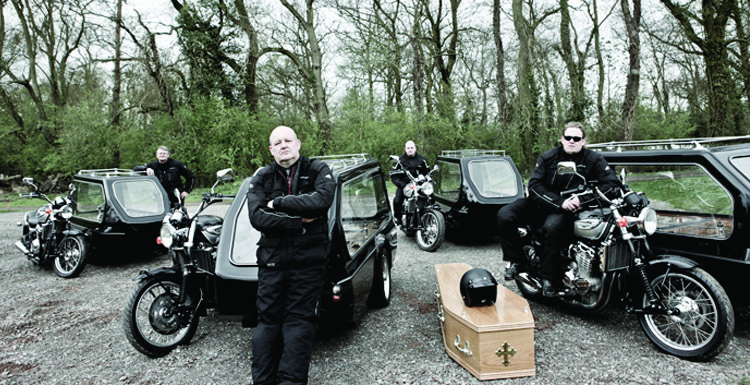 One thing’s for sure, a send off with Motorcycle Funerals is unlikely to go unnoticed. In fact not so long ago, the funeral of a motorbike fan attracted over 800 motorcyclists to the service. So if the thought of going out in style is what might have raised a smile with your dearly departed, contact Paul Smith. Rev by name, rev by nature.